On June 16th, the Men’s Eagles will travel to Houston, Texas for a weighted matchup with Scotland, currently seated No. 5 in the World Rugby rankings. The United States have become very familiar with BBVA Compass Stadium, home to the Houston Dynamo, as they return for the first time since a 2016 draw with Argentina XV during the Americas Rugby Championship. This marks the fifth time the Men’s Eagles have played at BBVA Compass Stadium. 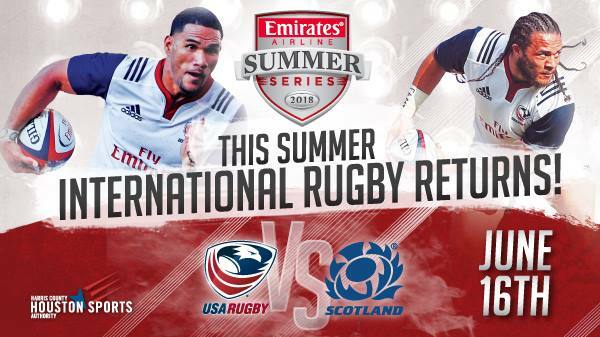 More notably, the Men’s Eagles will reunite with Scotland in Houston after an incredibly well contested showing in June 2014. The match is supported by the Harris County Houston Sports Authority and kicks off at 8:00pm CT.
Additionally, the match will broadcast LIVE on CBS Sports Network as part of the networks commitment to Rugby.